Way back when—before the trade deadline—when the Yankees were surging and the rest of the AL East was struggling to keep their collective noses over .500, it seemed the Bombers would be able to waltz to a division title with nary a challenge from the divisions other four tenants. As injuries have besieged the Yankees—just three games over .500 since August—the division title, and with it, a pass on the one game winner-take-all wildcard birth, has become a distant memory as the Blue Jays have soared. Obviously, failing to win the division is far from a death sentence, as last year’s San Francisco Giants showed, but the Giants had something this incarnation of the Yanks are still in search of: an ace. In a winner-take-all game, the last thing you want is any mystery or doubt in the man who has perhaps the greatest outcome on the game, your starting pitcher, but the Yankees rotation is rife with them. Tanaka has been a bit of an enigma: brilliant at times—take the August 15th complete game against Toronto as an example—but inconsistent at others, as his 3.38 ERA, which would be good for 24th in the league if he had enough innings to qualify, speaks to. A recent hamstring injury, and the announcement that he’ll start one more regular season game Wednesday against Boston, only complicates matters further, and threatens to derail what had been Tanaka’s best month of the year. The argument all season long has been with Dellin Betances and Andrew Miller at the back of the bullpen, the Yankees have the ability to make it a 6 inning game. While in a perfect world that may be true, the bullpen has shown clear signs of fatigue in the past few weeks. Betances has thrown more pitches than any reliever in baseball, and has labored his way to a decidedly un-Betances like 1.575 WHIP the past month. Chasen Schreve—one of the seasons most pleasant surprises—has hit a wall, pitching to a 10 ERA in September. If ever the Yankees need a starter to assert his dominance and flash the ability to pitch deep into ballgames, it’s now. Two of their hypothetical wildcard opponents have one—Houston in likely AL Cy young winner Dallas Keuchel, and Texas in World Series MVP Cole Hamels. Now, more than ever, the Yankees need someone—and that someone is named Tanaka—to step up and be that guy. Yankee legends make their names in October. 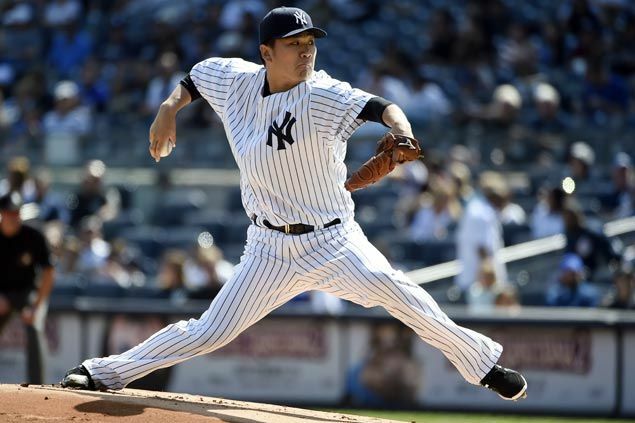 If Tanaka wants to earn that contract and live up to the expectation he has set for himself, he will have to do it now. If not, it could easily be a quick and disappointing departure from the postseason for the Bombers.